Your shoulder is made up of three bones: your upper arm bone (humerus), your shoulder blade (scapula), and your collarbone (clavicle). The head, or ball, of your upper arm bone fits into a shallow socket in your shoulder blade. This socket is called the glenoid. Strong connective tissue, called the shoulder capsule, is the ligament system of the shoulder and keeps the head of the upper arm bone centered in the glenoid socket. This tissue covers the shoulder joint and attaches the upper end of the arm bone to the shoulder blade. Your shoulder also relies on strong tendons and muscles to keep your shoulder stable. The shoulder is the most moveable joint in your body. It helps you to lift your arm, to rotate it, and to reach up over your head. It is able to turn in many directions. This greater range of motion, however, can cause instability. Shoulder instability occurs when the head of the upper arm bone is forced out of the shoulder socket. This can happen as a result of a sudden injury or from overuse. Once a shoulder has dislocated, it is vulnerable to repeat episodes. When the shoulder is loose and slips out of place repeatedly, it is called chronic shoulder instability. Shoulder dislocations can be partial, with the ball of the upper arm coming just partially out of the socket. This is called a subluxation. A complete dislocation means the ball comes all the way out of the socket. Once the ligaments, tendons, and muscles around the shoulder become loose or torn, dislocations can occur repeatedly. Chronic shoulder instability is the persistent inability of these tissues to keep the arm centered in the shoulder socket. Severe injury, or trauma, is often the cause of an initial shoulder dislocation. When the head of the humerus dislocates, the socket bone (glenoid) and the ligaments in the front of the shoulder are often injured. 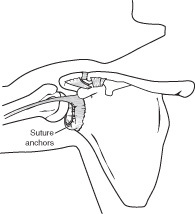 The labrum — the cartilage rim around the edge of the glenoid — may also tear. This is commonly called a Bankart lesion. A severe first dislocation can lead to continued dislocations, giving out, or a feeling of instability. Some people with shoulder instability have never had a dislocation. Most of these patients have looser ligaments in their shoulders. This increased looseness is sometimes just their normal anatomy. Sometimes, it is the result of repetitive overhead motion. Swimming, tennis, and volleyball are among the sports requiring repetitive overhead motion that can stretch out the shoulder ligaments. Many jobs also require repetitive overhead work. Looser ligaments can make it hard to maintain shoulder stability. Repetitive or stressful activities can challenge a weakened shoulder. This can result in a painful, unstable shoulder. Physical Examination and Patient HistoryAfter discussing your symptoms and medical history, your doctor will examine your shoulder. Specific tests help your doctor assess instability in your shoulder. Your doctor may also test for general looseness in your ligaments. For example, you may be asked to try to touch your thumb to the underside of your forearm. Your doctor may order imaging tests to help confirm your diagnosis and identify any other problems. X-rays. These pictures will show any injuries to the bones that make up your shoulder joint. Magnetic resonance imaging (MRI). This provides detailed images of soft tissues. It may help your doctor identify injuries to the ligaments and tendons surrounding your shoulder joint. Chronic shoulder instability is often first treated with nonsurgical options. If these options do not relieve the pain and instability, surgery may be needed. Activity modification. You must make some changes in your lifestyle and avoid activities that aggravate your symptoms. Non-steroidal anti-inflammatory medication. Drugs like aspirin and ibuprofen reduce pain and swelling. Physical therapy. Strengthening shoulder muscles and working on shoulder control can increase stability. Your therapist will design a home exercise program for your shoulder. Surgery is often necessary to repair torn or stretched ligaments so that they are better able to hold the shoulder joint in place. Arthroscopy. Soft tissues in the shoulder can be repaired using tiny instruments and small incisions. This is a same-day or outpatient procedure. Arthroscopy is a minimally invasive surgery. Your surgeon will look inside the shoulder with a tiny camera and perform the surgery with special pencil-thin instruments. Open Surgery. Some patients may need an open surgical procedure. This involves making a larger incision over the shoulder and performing the repair under direct visualization. Rehabilitation. After surgery, your shoulder may be immobilized temporarily with a sling. When the sling is removed, exercises to rehabilitate the ligaments will be started. These will improve the range of motion in your shoulder and prevent scarring as the ligaments heal. Exercises to strengthen your shoulder will gradually be added to your rehabilitation plan. Be sure to follow your doctor’s treatment plan. Although it is a slow process, your commitment to physical therapy is the most important factor in returning to all the activities you enjoy.